ModernLifeBlogs Health How to Buy The Perfect Mattress for Your Needs? How to Buy The Perfect Mattress for Your Needs? Editorial Team · @ModernLifeBlogs · Nov 11th, 2017 · Comments Off on How to Buy The Perfect Mattress for Your Needs? When you go out to buy a new mattress the options at your disposal can seem to be unending, and this can overwhelm many buyers. This is acuter if you are some who experiences chronic neck or back pains. Choosing the correct mattress can determine whether you get a good night’s rest or whether you are left in pain through the day. It is vital that you get yourself a good mattress to ease out your lower back pains. 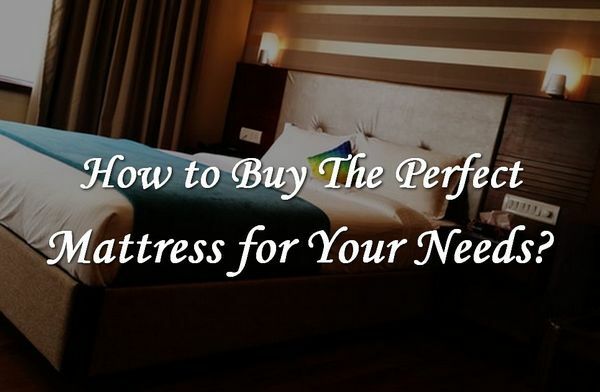 In this article, you will learn about some essential tips which can help you determine which mattress suits your necessities best. Read reviews, read specifications and product descriptions extensively before you buy yourself a new mattress. Focus on whether customers maintain that the mattress is firm and whether they mention that it has helped them relieve their back pains or whether it has given them any form of pain. A good mattress will align your body straight when you are sleeping and will not be conducive to backaches. In case you have any health condition, you must talk with your doctor or consult your physical therapist and see what he or she would recommend you. Remember that doctors are not mattress experts; however, they do know about your medical condition and your symptoms and thus, will probably give you sound advice from that perspective. Mattress sellers can label some mattresses as being “orthopedic” or even “medically-approved,” but there isn’t any medical organization which officially certifies any mattress to be eligible to carry those labels. They can have features which are orthopedic-friendly however, no medical group has ever verified this. Think again before you buy a hard or a firm mattress, research has revealed that for lower back pain the best is a medium firm mattress and not a firm mattress. There are differences between having a firm support and getting a firm feel. You will want support to be firm. However, it has to be with a comfortable feel. Comfort is subjective and should be decided based on what you prefer. People who are quite light-weight will not require extensive, bulky pillow top mattresses simply because they do not weigh enough that they will be able to compress and squeeze the inner foam to touch the underlying coils which form the support system of the mattress. Similarly, heavier people will feel a bit more comfortable when they have some extra cushion between themselves and the inner coils. You can consider buying a new mattress during the Black Friday mattress firm sales at discounted prices. Mattresses are an essential factor which determines the quality of your night’s sleep. A good mattress can ease tension and reduce your stress by helping you get a good night’s sleep. So choose carefully when you buy a new mattress. Jeannie Greenwood has mentioned many factors that are important to consider for purchasing the right mattress. She has also helped the readers to know about Black Friday mattress firm sales where they can expect quality products at unbelievable prices.